An extremely rare 342 carat diamond, The Queen of Kalahari, brings to life a new, exceptional High Jewellery collection, signed Chopard. The discovery , in the Karowe mine in Botswana, of The Queen of Kalahari, an exceptional diamond weighing 342 carats, of D colour and graded F (Flawless) clarity, led to a set of 23 diamonds, five of which weighing more than 20 carats, and representing the cuts the most appreciated: coussin, brilliant, emerald, heart, and pear. Thanks to the high expertise of Chopard’s master artisans, the Maison’s High Jewellery workshops gave back to the world six extraordinary jewels, composing The Garden of Kalahari high jewellery set, that was unveiled during the Haute Couture week, in Paris. I immediately sensed that this was an incredibly rare gem of exceptional beauty and purity. Because of both the gem and the creative vision’s exceptional nature, Caroline Scheufele personally supervised each and every phase of this process, by guiding it and by closely following each step of the project. “The ateliers really outshone themselves in working on this exceptional project and the synergies among the different crafts were further strengthened by the process”. Caroline Scheufele. The Garden of Kalahari stands out then as a unique collection of six jewels that testify, once again, the rich wealth and expertise of the master jewellers of Chopard’s workshops. 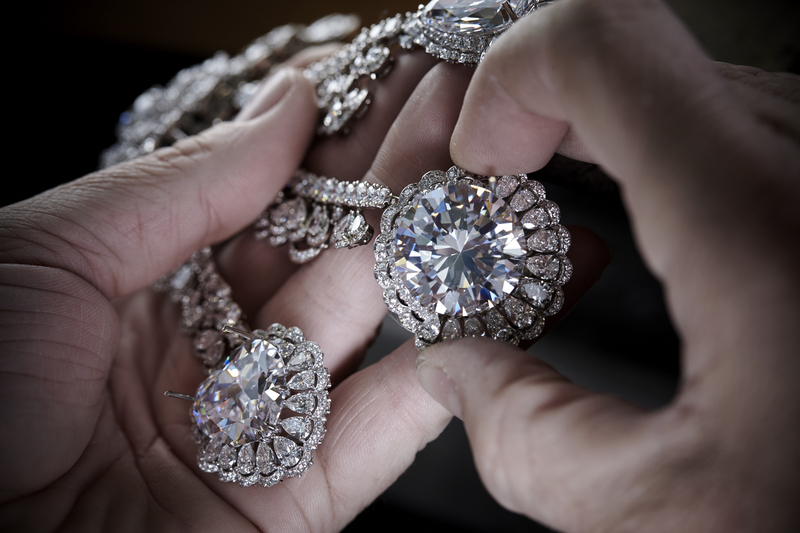 The collection alone represents almost a full year’s work: thousands of hours devoted to this endeavour involving the eyes, hearts and hands of the Chopard jewellery artisans and gemsetters. The five diamonds obtained by The Queen of Kalahari rough acted as the created guide of the vision that culminated into the design of The Garden of Kalahari jewellery set. The radiant 50-carat brilliant cut becomes then a sunflower, the 26-carat heart shape a delicate pansy, and the 25-carat pear shape a banana blossom. As for the perfect 20-carat cushion cut, it indulges in a gentle tête-à-tête with the flaming poppy, while the 21-carat emerald cut floats idly alongside a water lily. The centrepiece of this collection is a necklace that testifies to the ingenuity and playfulness governing Chopard design. This model is interpreted in four variations, the first of which is a gorgeous and utterly modern choker to be worn alone. An entirely invisible mechanism means it can be detached in the centre and adorned with an exquisite flower to form a more sophisticated version. And for festive evenings, this flower itself serves to attach three important and beautiful pendants, since they are adorned with the three biggest diamonds in The Garden of Kalahari: the 50-carat brilliant-cut, 26-carat heart-shaped and 25-carat pear-shaped gems. Each of these precious ‘attachments’ can be worn alone or together, culminating in the perfect necklace with all three at once, composing a very interesting visual asymmetry. Chopard, Queen of Kalahari, Collection exceptionnelle de diamants, necklace. Necklace in 18ct white ‘Fairmined’ gold adorned with three exceptional D-flawless 50cst brilliant-cut, 26cts heart-shaped and 25cts pear-shaped diamonds, a D-flawless 6.41-ct brilliant-cut diamond and fully set with pear-shaped (98cts), brilliant cut (40cts) and marquise-cut (2cts) diamonds. And because Chopard loves to combine beauty with fanciful touches, two of these pendants – the heart-shaped and pear-shaped diamonds – can be worn attached to the earrings, thus creating a spectacular set matching the necklace, adorned (or not) with the flower and the brilliant-cut diamond. Chopard, Queen of Kalahari, Collection exceptionnelle de diamants, earrings. Earrings in 18ct white ‘Fairmined’ gold adorned with two exceptional D-flawless 25ct pear-shaped and 26ct heart-shaped diamonds and fully set with pear-shaped (4.55cts) and brilliant-cut diamonds (4.35cts). The earrings can also be worn without the heart- and pear-shaped diamonds, for a more discreet version. This collection is further enriched by a cuff bracelet adorned with two emerald-cut diamonds; two rings of which one bears the 20-carat cushion-cut diamond; and of course an astonishing secret watch that is as delicate by nature as it was to create. Chopard, Queen of Kalahari, Collection exceptionnelle de diamants, ring. Ring in 18ct white ‘Fairmined’ gold adorned with an exceptional D-flawless cushion-cut diamond of 20cts and fully set with brilliant-cut (3.9cts) and pear-shaped (3cts) diamonds. Prsentation de la collection Chopard The Queen of Kalahari au Thatre du Chtelet, Paris le 21 janvier 2017. Secret watch in 18ct white ‘Fairmined’ gold set with two exceptional D-flawless pear-shaped and brilliant-cut diamonds and fully set with brilliant-cut and pear-shaped diamonds. Equipped with a Haute Horlogerie L.U.C 96.17-L caliber; micro-rotor in platinum set with diamonds. The Garden of Kalahari transforms a unique and modern vision of beauty in reality, and leaves the owner complete freedom to associate carats and shapes, thereby giving full scope to the fascinating diversity of moods, occasions and desires.